The 8510C vector network analyzer continues to provide the best performance to meet your new design and test challenges. With unmatched accuracy and convenience, the 8510C vector network analyzer makes broadband measurements from 45 MHz to 50 GHz in 2.4 mm coax, from 45 MHz to 110 GHz in 1.0 mm coax and from 33 GHz to 110 GHz in waveguide bands. The 8510C network analyzer measures the magnitude, phase, and group delay of two-port networks to characterize their linear behavior. 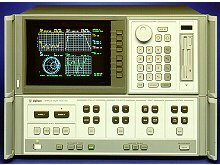 Optionally, the 8510C network analyzer is also capable of displaying a network¿s time domain response to an impulse or a step waveform by computing the inverse Fourier transform of the frequency domain response. The 8510C family of systems is modular. Choose the source(s), S-parameter test set(s), and test accessories to meet your measurement applications. This data sheet presents performance specifications for most standard 8510 network analyzer systems. To acquire specifications for system configurations not covered in this data sheet, refer to the 8510 Specifications and Performance Verification Software (part number 08510-10033) which is shipped with all 8510C network analyzers, test sets, and calibration kits.